Miami’s skyline expands outwards and upwards every year, accumulating block after block of impressive luxury buildings, each striving to stand out in the city’s growing urban landscape. While the eye immediately goes to the exteriors, crafted by architectural icons like Zaha Hadid and Pei Cobb Freed & Partners, the interiors of these spaces are just as preciously curated and developed to create a harmonious synergy between the outside and the inside. 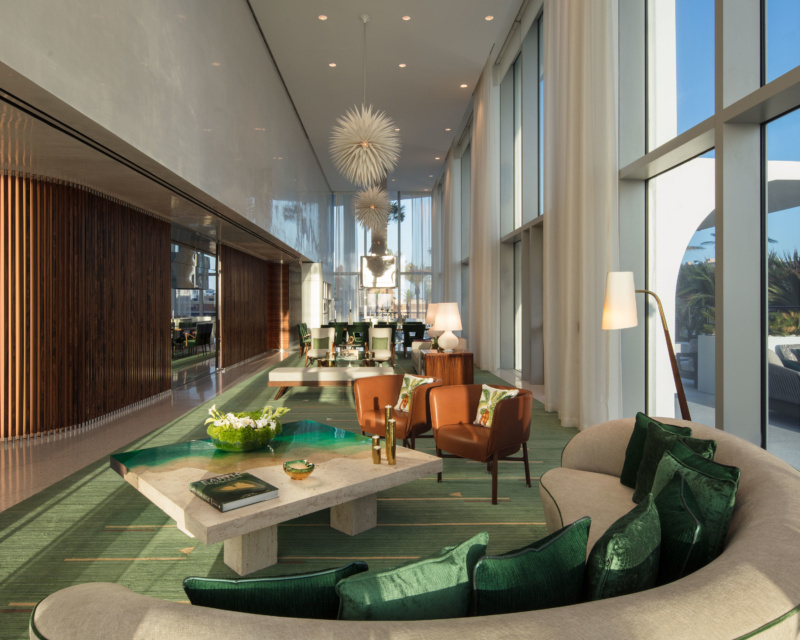 Interior designer Pierre-Yves Rochon is widely recognized for his ability to do so—from the Waldorf Astoria in Beverly Hills to the Ritz Carlton in Tianjin, China. Ana Cristina Defortuna, vice president of the Miami-based real estate organization, Fortune International Group, sat with Rochon to get down to the details of his practice—namely the interior of Jade Signature, FIG’s Herzog & de Meuron–designed residential building in Brickell. Ana Cristina Defortuna: How long did the process take from start to finish? Pierre-Yves Rochon: I believe the project lasted about four years—but when you love something, you don’t count! ACD: How did the building’s setting on the beach influence your design decisions? PYR: It’s clear that the star here is the ocean—the architecture highlights transparency and views, and the white helps translate the brightness of the beach and the ocean. The harmony of colors based on blues and whites or greens, beiges and whites are like a mirror reflecting the ocean and the beach, with lush gardens surrounding the building. ACD: A vast majority of your recent work is more traditional and embraces that look. How did you adjust yourself to the very modern and dynamic city of Miami for this project? PYR: Everyone seems to forget that at the beginning of my career, I did more contemporary projects. It was later, after I became interested in all types of styles, that I became involved with more traditional projects. However, creativity is independent of style. Regarding Jade Signature and the Herzog & de Meuron team, I have always dreamed of working with great architects. At the beginning of my career, I was able to work with the late and great Brazilian architect, Oscar Niemeyer. In this project, I felt his influence and the spirit of South America and Miami with the white chosen for this building—it felt like the signature component. ACD: You’ve designed more than 200 spaces and never do the same thing. How do you keep it fresh in terms of where you look for your inspiration and references? PYR: This has been the DNA of PYR ever since I started the company. We always want to do different projects. That’s the real creativity. To sustain this is a great challenge, because it is a permanent state of questioning yourself. Being in fashion or trendy does not interest me. Being yourself is more important than being fashionable. ACD: Herzog & de Meuron’s architectural design for Jade Signature is strong and beautiful. How were you able to create a seamless connection from the outside to the inside so that when residents arrive, it feels like home? PYR: From day one, I liked very much the architecture of Herzog & de Meuron. I had to be humble and respectful and understand how to complement the building with the interior experience. This starts with the building’s architectural “ribbon” to which we added curved interior forms as an extension of the exterior. Respect for simple materials, such as terrazzo, also helps translate the exterior design language. ACD: How was your experience working on the Jade Signature project with Fortune International Group? PYR: For a project to succeed, the interior designer needs a good client. With you and your husband, Edgardo, this was the case; without you, the project would not even exist. It takes courage to choose a new architectural form, completely different from the traditional architecture of Miami and all the glass towers. When you chose PYR for the interiors, I knew the challenge would then be to create a soft residential interior that respected the exterior. The collaboration was wonderful because of the confidence and respect for each member of the team. With that, we could only succeed.